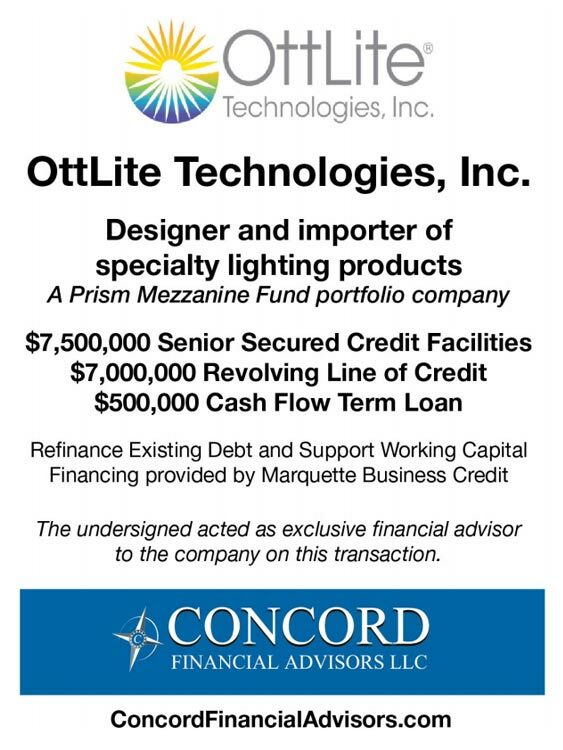 OttLite Technologies, Inc. is a designer and importer of specialty lighting products (the “OttLite”) and was purchased by a private equity sponsor in 2006 and had recently restructured its balance sheet with the strong support of Prism Mezzanine Fund, which now owns a controlling interest in the Company. Highlighting the Company’s strong new management team, committed and supportive ownership, strong gross profit margins and leadership position in its product category, Concord sourced several proposals and concluded, along with management, that Marquette Business Credit was the best fit for the Company and the deal closed within 60 days of signing Marquette’s Term Sheet. The entire process was completed in 120 days.